looking for something yummy to make to take to the next tailgate party? do you want to surprise your neighbor with a special treat? need a dessert for tonight's dinner? This fall, warm your family’s hearts and home with a fresh-from-the-oven treat that won’t have you spending hours in the kitchen. New Milk Chocolate Traditional Brownie mix from Betty Crocker® can help you simplify your brownie baking regimen and get a head start on homemade. 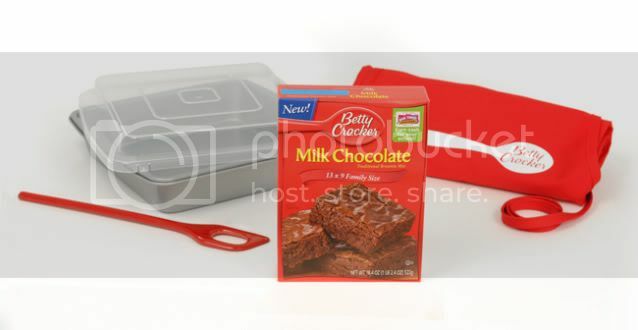 the kind folks at betty crocker and myblogspark.com sent me this fabulous gift pack to try these brownies for myself. i made them for a friend's going away party a couple of weekends ago. i tasted one straight from the oven...oh my! i almost kept them all for myself! these milk chocolate brownies are A-MAZ-ING! the guests at the party thought so too. i didn't even have crumbs to bring home. Look for Betty Crocker Milk Chocolate Traditional Brownie mix in the baking aisle of grocery stores this fall. wanna win a fabulous gift pack of your own??? you'll receive a milk chocolate traditional brownie mix, a betty crocker apron, a cookie sheet, and a mixing spoon. * "like" betty crocker on facebook. * follow betty crocker on twitter. * blog about this giveaway. leave an extra comment for each entry option you complete. six total opportunities for entries! Disclosure: The product, information and prize pack have been provided by Betty Crocker through MyBlogSpark. All opinions are my own. I'm lovin' finding new ones on Pinterest right now. I also love Fresh Apple Cake with Rum (extract) sauce. Oh my! My favorite fall food is apple pie. I love apple dumplings too, but I have never made them homemade. My fall faves are pumpkin pie and Grandma's ham (with pineapple, cloves, and brown sugar). Mmmmm!!!!! I like Betty Crocker on Facebook too!